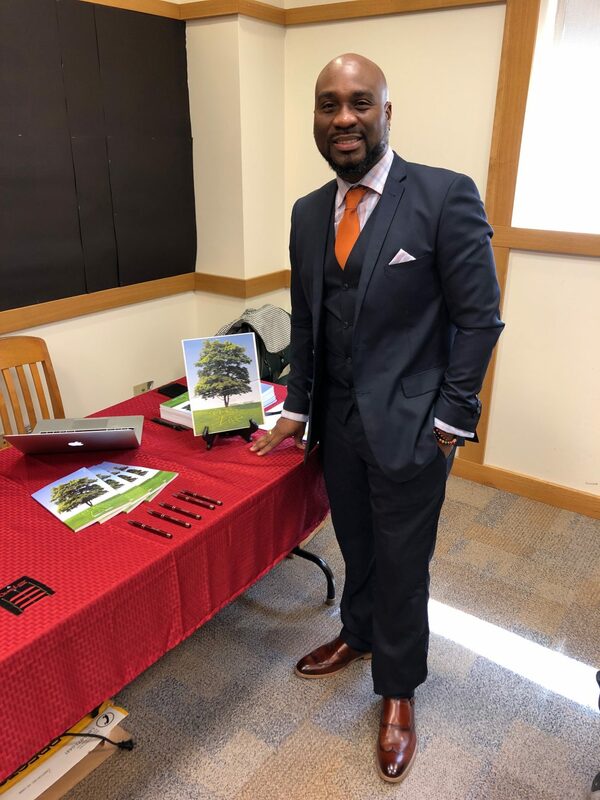 Poet Markell L. Mooney held a book signing and impromptu poetry slam Saturday to unveil his newly published Words of Life. Mooney, 42, said it took him 11 years to write the book, which is a compilation of poems he has written since 1997. Words of Life is split into three parts: The Words, Words of Love and Words of Life. “I write about love, family, social and economic issues. I took my entire collection and categorized each poem to fit in their own sections,” Mooney said. He first became interested in writing in his late teens, inspired by Jim Morrison, Maya Angelou and Stevie Wonder. Since then, his writing process has become more complex and includes using poetry as a therapy to get him through difficult times. Extra mild sauce and salt and pepper, please! 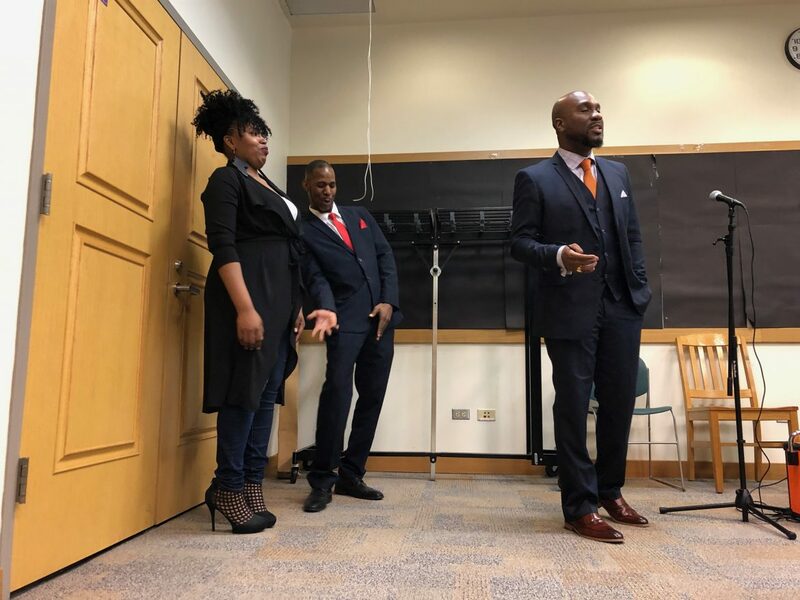 Mooney hosted Saturday’s event with two close friends, Markell Thompson and Shamara Pugh, whom also recited their original poetry. They received a roaring encore from the crowd that then led to an impromptu poetry slam, pitting the three poets against one another. “It’s not really a competition; it’s a language and everyone speaks in their own way. We can do what we do in front of the crowd, and then come back and still be best friends,” Thompson said. Thompson, 27, is CEO of E.P.I.C. Movement, an organization that holds poetry workshops and open mic nights. Thompson and Mooney met at a poetry event in 2016. Since then, the pair has hosted events together, including the annual Poetry on the Patio held in Austin each summer. Mooney’s book inspires Thompson because of the “rawness” of the work. “It’s a book I appreciate because I know it’s heartfelt, real and basically a confessional,” Thompson said. Pugh also known as “Prolific,” is a 23-year-old spoken word artist and vice president of E.P.I.C. Movement. Pugh said witnessing the process of Mooney put “everything on the pages” was empowering. “Writing is so powerful. When you take that extra step to express yourself in any form, it’s beautiful,” Pugh said. Sanford Prude was especially impressed and inspired by Words of Life; Prude and Mooney have known each other through their membership in the Most Worshipful Prince Hall Grand Lodge Free and Accepted Masons state of Illinois. “I’m extremely proud of my brother. He’s making a great effort to better himself through his poetry. I’m excited to see what his future holds,” Prude said. Mooney recently applied for an Illinois Arts Council grant. Should he receive the $1,500 grant, the money will help him attend book festivals and professional development seminars, including the African-American Book Festival that will be held in Austin, Texas in June. Along with selling Words of Life on Amazon, Mooney has put in requests to circulate the book in Chicago Public Schools as well as the Chicago Publish libraries. Mooney, who works as a substitute teacher, will continue hosting Poetry on the Patio at 5156 W. Concord Place; he’ll announce the dates for the summer events as soon as they’re set. In a recent Chicago Tribune story, 19-year-old Malcolm London shares his passion for the written word and tells his story from growing up on the West Side to his recent appearance on national television. The 16th annual outdoor spoken word showcase will be held from 8 p.m. to midnight July 21 at 5156 W. Concord Place. There will be free food and an open mic. Kell-O-G is the host.